I'm so excited to be sharing a shoot I did with a local clothing company here in Oakland called Oaklandish. 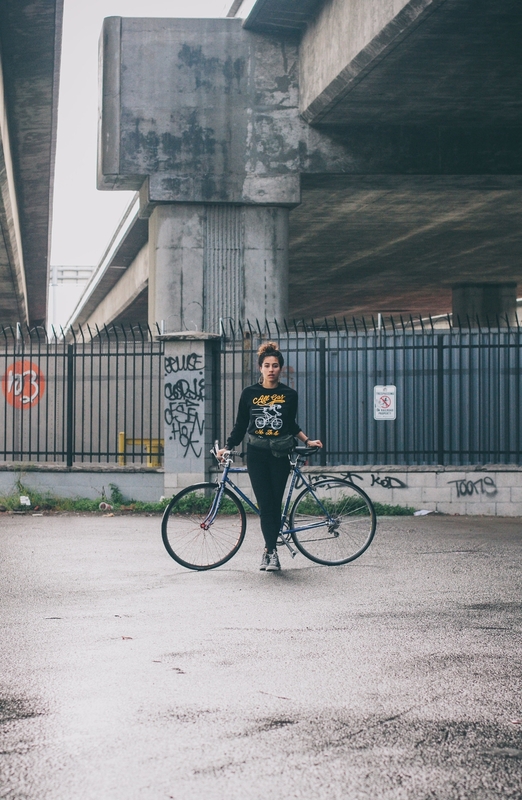 Oaklandish is a great company that represents Oakland on a variety of styles of apparel. They also support local artists and nonprofits who are doing positive work for the community. (So after checking out this amazing blog post hop on over to their site and support them! Plenty of link sharing will be added below). I feel like just going into the whole story of how this amazing opportunity came about, 1) to share with all of you fine folks who read, AND FOLLOW-hint cough, my blog but also for myself so someday I can look back and be like, "Oh damn you're so cool!" I've never been the kind of person to 'rep' my hometown. I don't follow sports, so no home town team to support, and in high school it wasn't 'cool' to wear a sweater that said 'Simi Valley Pioneers' on it. Oakland is the first place I've lived where I want rep this place. There's so much to explore and check out and I've met so many inspiring, creative, fighters for change, fun, and just all around amazing people here in Oakland. I had been meaning to reach out to Oaklandish to see if they were ever in need of a photographer when one day I open my email and it said 'Oaklandish'! I called the gal who emailed me, Kat-who put this whole thing together found the location, the models, and did the styling all around very cool gal, and she said, "Oh, I didn't expect to hear from you so soon." :) I'm quick lady! Ain't no one taking my job! As soon as we got off the phone I called my boyfriend and proceeded to jump up and down in my room as he yelled in excitement and told me I'm cool :). What felt like 5 weeks, but was probably only 1 week, later I heard from Kat (IG: hendrixmomhasgotitgoinon) and she said they were going to use me for their shoot! (queue more excitement here)! It was raining that day, which I've now interpreted to mean rainy days ='s amazing shoots. We met up at Oak Supply Co. another one of their shops in West Oakland. Kat showed me around the shop and the outfits she had put together. Our first shoot was with Mariah (IG: thirdspacedesigns) she did the 'Bike Party' theme and rocked it! Her series is probably one of my favorites from the whole shoot. I loved the location in West Oakland and the sweater was sick (I love skeletons). We also shot shortly after it stopped raining but it was still overcast outside. The second look was with Kat herself and she did the work wear look. Again down in West Oakland against this awesome building down there. The fourth look was with my favorite gal Daniela. You can see more of her basically anywhere you look on this site. I love this gal she's so inspiring and up for anything! I was so excited when I found out that we would be able to work on this shoot together. Her look was 'Day at the Lake.' We took some shots down by Lake Merritt and naturally I took a million of her because I love her so! (IG: babygirldee). The last look was 'Night on the Town' this one was also another one of my favorites because our model had an awesome look! Kat took a men's shirt and cut off the sleeves paired it with a pencil skirt bam ready! (IG: rudiracquel). We shot this one downtown also and I just love the way the background works so well with her outfit and look.